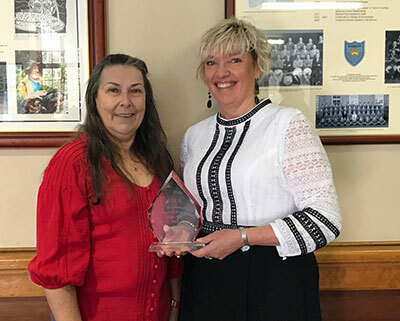 The Australian School Library Association Inc. has pleasure in announcing the winner of the 2017 Australian Teacher Librarian of the Year Award - Jane Viner, Head of Library Resource Services at Kilvington Grammar School, Ormond, Victoria. 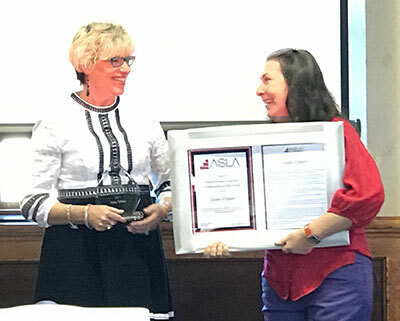 This prestigious national award recognises and honours an exceptional Australian teacher librarian in a school setting whose professional practice has a positive impact on student achievement and information literacy. ASLA describes the role of a teacher librarian as having three key professional areas: professional knowledge, professional practice and professional engagement. The Australian Teacher Librarian of the Year is awarded to a teacher librarian who demonstrates a level of excellence in each of these three components of their role and thus provides a library and information service that improves student learning. The 2017 Australian Teacher Librarian of the Year, Jane Viner, has extensive experience as a school library leader, teacher librarian, teacher, professional association member, presenter and school library advocate. Jane is a qualified secondary teacher in Geography and Library and has a Master of Information Management and Systems from Monash University and has been a teacher librarian since 1980. 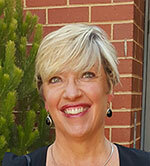 Jane has led school library teams since 1984 at a variety of independent and government schools in Melbourne suburbs. As a committed and experienced professional Jane has willingly contributed her time and expertise to the advancement of school libraries and library organisations at the local, state, national and international level. In 2007 Jane was invited by Oakridge International school in Hyderabad, India to present a two-day program for IB Diploma students and staff on the IB Extended Essay Library Program and to prepare a report on collection development for their school library. Jane also presented a lecture at G.D. Goenka World School, Sohna, New Delhi. In 2008 Jane was recognised for her commitment to the school library community in Victoria with the John Ward award and internationally with the IASL award. During her extensive career Jane was invited to present at local, interstate and international conferences including ASLA, IASL, IBO - IBAP, SLAQ, SLAV and EduTECH. Jane has presented internationally in Beijing, Hong Kong, China, Singapore, Malaysia and New Zealand aswell as New South Wales, Queensland, Tasmania and Victoria. Jane presented at EduTech 2015 and was a panel member at EduTech 2015 and 2017. Her expertise and consultancy advice was sought by two schools in India where she presented workshops on the Extended Essay Research program. 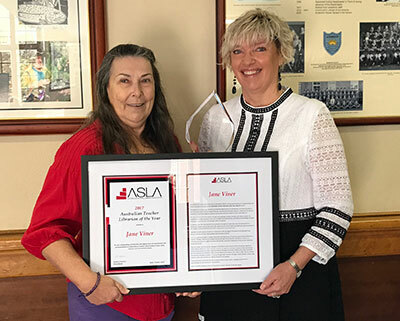 In 2008 Jane received two awards for her services to school librarianship – the SLAV John Ward Award for Victoria and the IASL for services to international school libraries. She has been published in a variety of journals and was selected to be interviewed for Dr Patrick Lo’s upcoming book “Effective School Librarianship: Successful Professional Practices from Librarians around the World” Chapter 9 – Jane Viner - “Making a difference to student learning through school libraries” to be published by Apple Academic Press, USA, in 2017. Jane has been a past Chairperson of the IBAP Library Group, Vice President of SLAV, Co-Convenor of Central Metropolitan and Southern Metropolitan Branches, Council and executive member of SLAV, committee member of VALA and member of the ALIA Policy Advisory Group for School Libraries. She has held positions of responsibility in a range of library organisations including ALIA, ASLA, IBAP LIS, IB PALMS, IB SEALS, SLAV and VALA and during her time in schools Jane has mentored teachers, teacher librarians and library and audio visual staff. At Kilvington Grammar Jane has continued her professional role as a teacher librarian, Geography teacher, Tutor and Head of Library Resource Services with the support of the McKie Library team and the school community. In 2015 the McKie Library was a successful nominee in the ALIA Great School Libraries campaign. Jane enjoys connecting students to reading, making a difference to student learning outcomes each day and is a passionate and enthusiastic member of the teacher librarian profession. 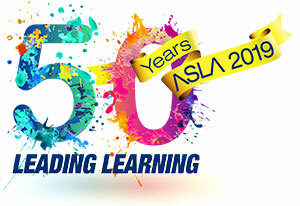 I would like to firstly acknowledge ASLA for the honour of the National Teacher Librarian of the Year Award. I feel greatly privileged to be chosen to represent our profession and continue to be an advocate for the importance of school libraries, teacher librarians and professional library staff. I love school libraries because we can make a difference in the life of a child, a student, young adult, teacher, staff member and parent. Teacher librarianship, has two aspects I believe - reading and literature and information and digital literacy. As a teacher librarian we can be the one that inspires a child to read, connects a student with a book, opens up the world to the wonder of books and reading. The other focus of connecting students and staff with key, quality information resources both digital and print, to ask the right questions, to guide their inquiry, to target your topic by selecting and sorting resources, using reputable websites and to learn how to acknowledge your sources of information and develop an understanding of plagiarism. The thrill of the chase – finding the elusive resource that engenders excitement in students and staff. The fabulous feeling when a student rushes into the library to you and says "Mrs Viner- now I know why I like reading - this book is fantastic - are there any more like this?" This brings joy to my heart and makes the day to day photocopier dramas melt into insignificance and reaffirms your role as a TL and the support of your team. School libraries are places where the letter "C" is key: create, connect, collaborate, communicate, care and change with your community. Personally and professionally you need to demonstrate enthusiasm, energy, excellence and be a risk taker, step outside your comfort zone, move the goal posts including the furniture, challenge the expected, go with your gut feeling and make a difference to the student learning outcomes in your school. To ASLA who funded this award a big thank you. To my husband Wayne, my adult children and their partners, my family and close friends who have unconditionally supported my professional goals and educational journey through the decades of teacher librarianship. I think I may be the only TL with a grand-daughter named Arlia. I have been a TL from day one in schools back in mid - 1980 and continue to love it many moons later. To my nominees, without you I would not be standing here today - Mr Jon Charlton, Principal of my current school Kilvington Grammar, to Ms Lynley Clarnette, Academic Dean of Humanities and to Mrs Kathleen Javen - parent, library volunteer and a librarian - these three people believe in what I try to accomplish on a daily basis and continue to be a wonderful support professionally. Last, but never least a thank you to the library organisations locally SLAV, nationally ASLA and ALIA and internationally IASL, to my IASL and IBO library colleagues, to the Principals and staff who have supported me throughout my journey in schools and school libraries. To the Kilvington Grammar teachers, staff, students and parents and to our McKie Library team - you are all part of this award and have enabled me to be standing here today as the 2017 recipient of this prestigious award and honour. ASLA President, Sandy Amoore presents Jane with her award.